230 pages | 16 B/W Illus. how do some narratives gain dominance over others? how are organizational members and external stakeholders engaged in the telling and re-telling of the organization? The empirical case studies provide much needed insights on the function of counter-narratives for individuals, professionals and organizations in navigating, challenging, negotiating and replacing established dominant narratives about "who we are," "what we believe," "what we do" as a collective. The book has an interdisciplinary scope, drawing together ideas from both storytelling in organization studies, the communicative constitution of organization (CCO) from organizational communication, and traditional narratology from humanities. 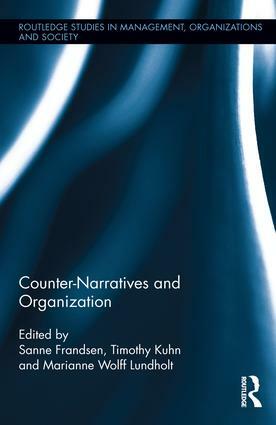 Counter-Narratives and Organization reflects an ambition to spark readers’ imagination, recognition, and discussion of organization and counter-narratives, offering a route to bring this important concept to the center of our understandings of organization. Sanne Frandsen is a Post Doc in the Department of Business Administration at Lund University, Sweden. Timothy Kuhn is a Professor in the Department of Communication at the University of Colorado at Boulder, USA. Marianne Wolff Lundholt is an Associate Professor at the Department of Design and Communication at the University of Southern Denmark, Denmark.